India is a country has known and recognized for its hospitality not just towards people, but also towards our animal friends. Many animals have a historical and emotional connect or bond with Indians. We have lived and worked together in harmony since the times of civilization. These animals obviously have a special place in our hearts and we do whatever we can for them. This article is the story of an Elephant spa set up in Guruvayur, Kerala for our friends, the Gentle Giants. The state of Kerala has set up an elephant spa in Guruvayur. Dozens of these pampered gentle giants can be seen during the month of July enjoying lavishing spas, scrubs, massages, and nutritious eatery at the Punnathur Kotta Elephant yard. This tusk friendly rejuvenating elephant spa is attached to the famous Guruvayur temple where elephants play a vital role in temple processions. Kerala has a long history when it comes to bonding with elephants. Elephants have helped build temples and structures. They were the vehicles for gods and kings. Elephants were also kept as pets by the wealthy ones! Every temple festival in Kerala has an elephant temple procession. Kerala is also known for its ‘Trissur Pooram’ that happens every year. So, Kerala also makes it a point to give the busy beasts a month off and pamper them like babies! This elephant sanctuary, which is also known as ‘Aanakotta’, meaning Elephant Fort was previously a palace. This Aanakotta can host up to 59-60 elephants. The locals pamper these giant mammals with massages, spa, and ayurvedic food that helps them rejuvenate. But, not any and every elephant can come to this camp. The tough or the rowdy elephants are not allowed to come since taming them becomes difficult and they can become more fierce due to the pamper and can hurt other elephants. Vets also give all the elephants of a medical check up and only the ones which need the care usually come in the first set of batches. Although this place seems like the perfect haven for these elephants, Aanakotta also faces severe criticism from animal rights activists. Complaints have been registered against Aanakotta for ill-treatment of these creatures, where the mascots have been seen to hit the animal or beat it if it does not follow instructions. 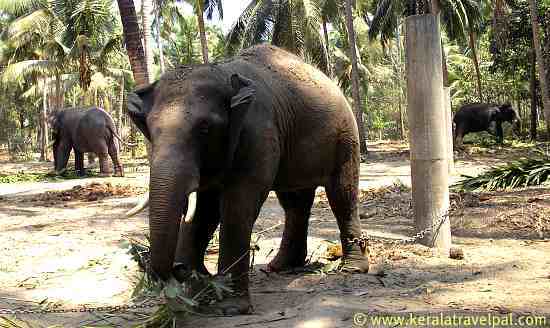 Another complaint against Aanakotta is the lack of space provided for the elephants. According to many wildlife activists, every elephant should be provided a legally prescribed space of 1800 SQ. Feet. But when 59 elephants are kept together in an elephant spa, it is difficult to keep up with such figures. Each elephant is bathed twice a day- morning and evening by two mahouts for each elephant. Each elephant is given a daily massage using a pumice stone and coconut husks which enhance blood circulation. They are fed 300 kg of green fodder per day. Small treats of 50 kg rice mixed with jaggery, turmeric, and other ayurvedic tonics are given. The elephants are taken for regular walks to tone their limbs and muscles. Despite the huge costs, the Kerala government does all it can for these gentle giants as a way of expressing heartfelt gratitude. It shows how important animals are to us. It is a way of treating them as our equal. For the kind of love, we show, our animals we might just try adding their name to the Aadhar list since they are also family!